A huge planet, ten times as big as Earth, might be hiding on the edge of our solar system. For years, some have speculated that our planetary neighbourhood includes a strange and secret resident: Planet Nine. The world is too dark and far away for us to have seen, but is having unusual effects on our universe, experts claim. Now a new study appears to strengthen that idea, suggesting that there are in fact nine planets in our solar system. The new research is based on an asteroid called 2015 BP519, which orbits far away from us and the sun out at the edges of the solar system. That asteroid was found three years ago, and has been tracked ever since. Now researchers say that tracking has shown something strange about the rock’s orbit. It appears to be moving as if there is some large and unknown object acting upon it, they say. While studying the planet, researchers noticed that it is slightly askew from the orbit of other planets including the Earth and most of the objects in the solar system. To try and examine why, scientists ran a series of different simulations of the solar system. They found that the model made most sense if there was a large and distant planet that moved the asteroid – which is exactly what the Planet Nine hypothesis suggests there is. As with the rest of the evidence for Planet Nine, the new research is based on suppositions. 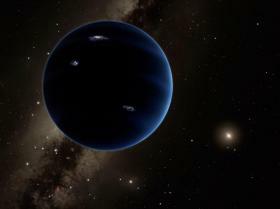 The effects of the potential Planet Nine have only ever been seen indirectly, by observing the movement of objects that would be affected by it. If it does exist, it is almost certainly too dark to actually see. As such, even knowing that it exists will make it very difficult to actually spot or to study – though scientists hope that steadily pinning down its actual position could allow it to be observed with telescopes.